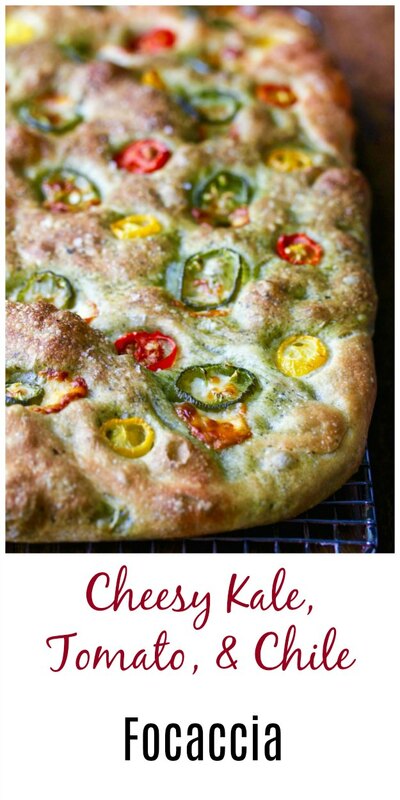 Cheesy Kale, Tomato, and Chile Focaccia. 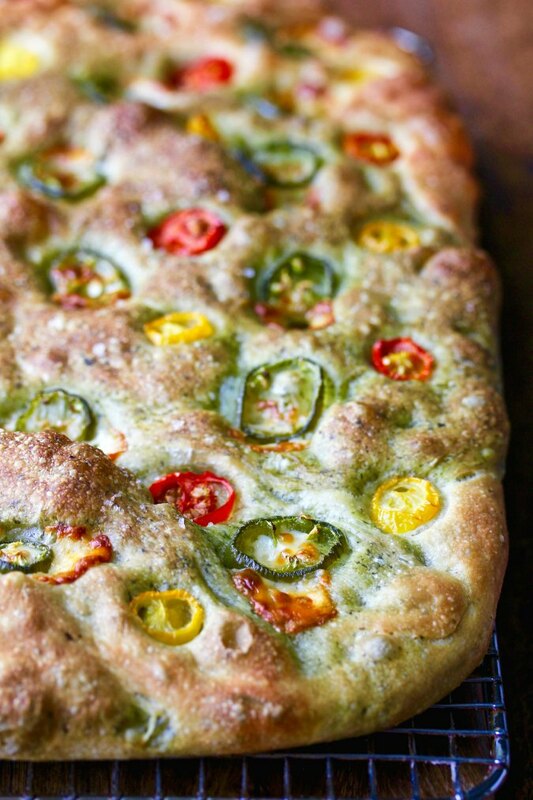 Light and airy, studded with pockets of mozzarella cheese and topped with cherry tomatoes and jalapeño chiles. I made this focaccia with an 80 percent hydration dough, which I let rise overnight in the refrigerator. You can actually keep this dough in the refrigerator for up to four days before baking, which is wonderful for developing the best flavor. I also experimented with infusing the water in half of this dough with pureed kale. I had this vision of creating a marbled effect with the two doughs, but the kale water changed the stretchiness of the dough half (it seemed to be stronger), so I ended up laying the kale infused dough on top of the dough without the kale water. In the end, both layers of dough turned out super light and airy, and totally delicious. You can make this focaccia with or without the kale water (you can't really taste it), but it was fun to experiment. I think next time I will use the kale water for all of the dough to create a totally green effect. 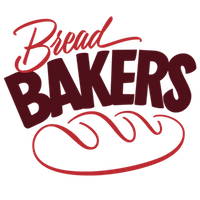 This month the Bread Bakers, hosted by Mireille of The Schizo Chef, are making Naturally Colorful Breads, or breads infused with colorful spices, vegetables, or fruits. After the recipe, check out the rest of the colorful breads. Recipe Note: I decided to try using kale, as I had some left over from another recipe. I think you could use a number of leafy greens (spinach comes to mind) that you might have in your vegetable bin. To make the kale water, you just boil a handful of kale leaves in water for about 10 minutes and then puree the mixture in a food processor or blender. I did this with some baby kale that was a bit past its prime, and froze the water to use later. This cheesy kale, tomato, and chile focaccia is delicious warm from the oven (you only have to wait 10 minutes!). Leftovers are fabulous split and toasted, and dipped in flavored olive oil. I also used split and toasted leftovers to make sandwiches. In a large bowl, whisk together the flour, salt, and yeast. Add the water and mix by hand or with a dough whisk for about a minute, until the flour is fully incorporated. Let the dough rest for five minutes. Add the olive oil to the dough, dip your hand in water, and mix in the oil for one minute. The dough will become smoother once you add the oil. Cover the bowl and let rest for 10 minutes. With wet or oiled hands, stretch and fold the dough over itself from all four "sides" of the dough. Form the dough into a ball, cover, and let rest for 10 minutes. Repeat the "stretch-and-fold" three more times, every 10 minutes. Line a half sheet pan with parchment paper and oil it with 2 tablespoons of olive oil. Transfer the dough to the pan and drizzle the top of the dough with a tablespoon of olive oil. With your fingertips, begin dimpling the dough to encourage it to spread across the pan. You are done when the dough covers about half of the pan. Cover the pan with oiled plastic wrap and place the pan in the refrigerator overnight, and for up to four days. About 3 hours before baking, remove the pan from the refrigerator and place it in a warm spot in your kitchen (if your kitchen is cold, allow more time). Dip your fingertips in olive oil, and begin dimpling the dough to encourage it to spread and cover the pan. When the dough begins to resist, cover the dough and let it rest for about 10 to 20 minutes. Repeat two more times, until the dough almost covers the entire pan. Press the cheese cubes into the dough, evenly spacing them apart. Top the dough with the tomato halves, cut side up, about 3 to 4 inches apart. Add the jalapeño slices, evenly spaced. I placed them on top of the cheese slices. Lightly sprinkle the top of the dough with coarse sea salt. Cover the pan and let the dough rise until it is about 1 inch high. This should take about 60 to 90 minutes. If your kitchen is cold, it may take longer. Heat the oven to 500 degrees F. Place the pan in the oven and immediately lower the temperature to 450 degrees F. Bake the bread for 12 minutes, rotate the pan, and bake for an additional 15 to 20 minutes, until the the bread is golden brown. Check the underside of the bread to see if it is crispy. Using a large metal spatula, slide the focaccia onto a wire rack to cool for 10 minutes. Move to a cutting board to slice and serve. I love that side shot where we can see the green dough so clearly, Karen, but your colorful top is just as pretty! Maybe prettier. Thanks Stacy. I kind of agree with you =) Less like a science experiment. Such a colorful bake Karen. Love the subtle green and how cheerfully colorful the topping looks. Thanks! I might try spinach for a brighter green next time. Oh my that is such a colorful focaccia Karen. It looks so airy and delicious. And those toppings look and amazing. Such a vibrant bake Karen. 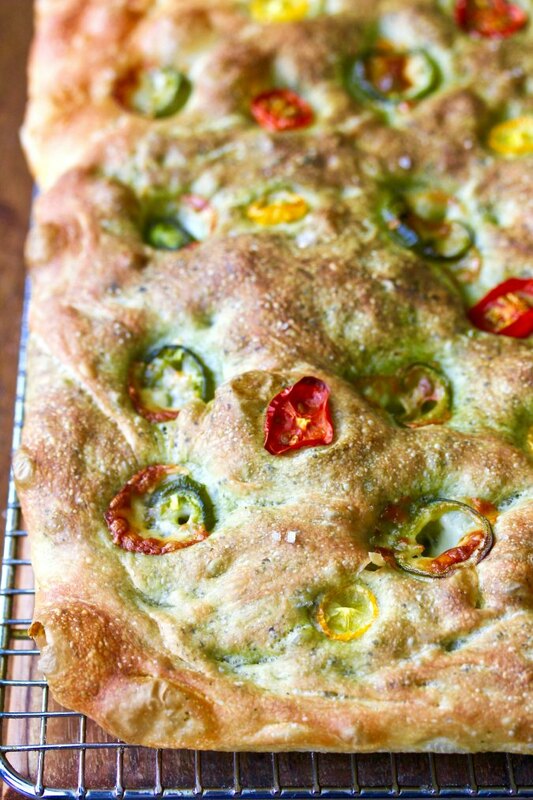 I love focaccia so added this recipe to my "to do list". 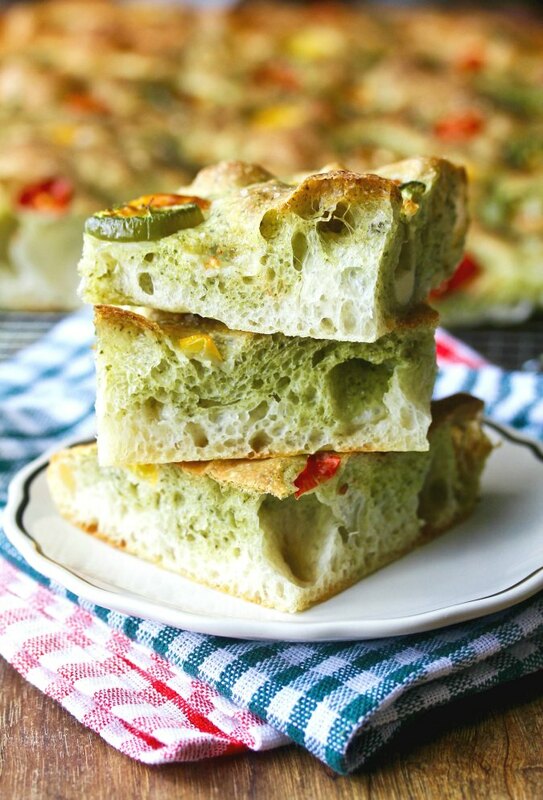 A beautiful green focaccia and that looks so tempting delicious!